Seven photographs of "Ole HaGardom" Avshalom Haviv and five photographs of his family members, during official memorial ceremonies. Jerusalem and other places, ca. 1930s through 1970s. Among the photographs: a photograph of Avshalom with his family from his childhood; photograph of Avshalom and his sister Ruth, building a snowman on the roof of their house in Jerusalem; Avshalom in Palmach uniform on the beach; portrait photograph of Avshalom and his brother Israel; two photographs of Zalman Shazar shaking the hand of one family member (most probably Avshalom's father, Eliezer); two photographs of Menachem Begin and the family members; and more. Two photographs appear in two copies. Six photographs are titled and dated on the back. Ink stamps on the back of three photographs. 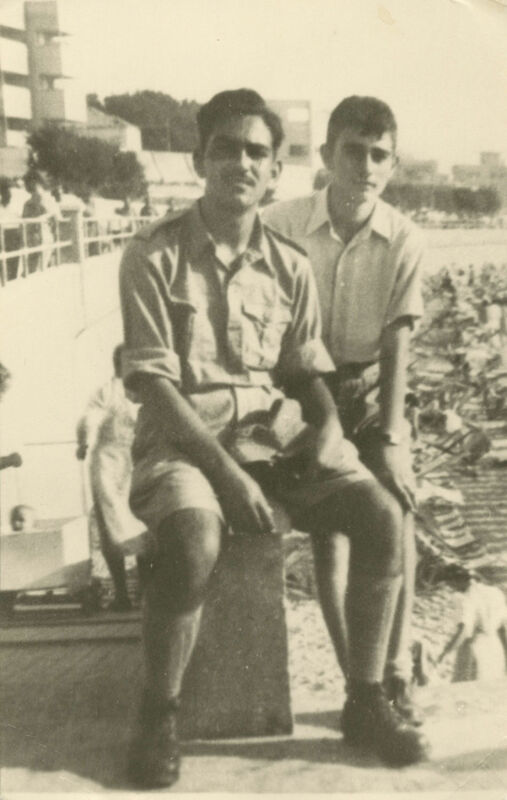 Avshalom Haviv (1926-1947), Palmach and Etzel (Irgun) member, one of the ten underground activists sentenced to hanging by the British ("Olei HaGardon"). Haviv participated in numerous operations (among them the release of illegal immigrants from Atlit detention camp, attack on British secret police offices and bombing of the Goldschmidt British officers' club). On May 4, 1947 he was arrested together with four of his friends while breaking into the Acre prison. During his trial, Haviv refused to acknowledge the authority of the court, rejected the offer for legal defense and instead asked to read a long declaration, voicing his stands and beliefs. On July 29, at four o'clock in the morning, Haviv was taken from his cell and was led to the gallows singing "HaTikva". Enclosed: three portrait photographs of Avshalom's brother, Israel Haviv; three invitations to ceremonies and official occasions in memory of "Olei HaGardom"; booklet commemorating "Olei HaGardom" issued by the Tel-Aviv-Jaffa Municipality; certificate of appreciation on behalf of "Misdar al shem Zeev Jaborinsky" awarded to the author Aryeh Eshel, following the publication of his book about Avshalom. 12 photographs (two appear in two copies). Size and condition vary. Good overall condition. Stains and blemishes (mostly slight). One photograph has four pinholes at the corners.